Portland Alliance for Democracy held its First Annual Judges Ramble on Friday. 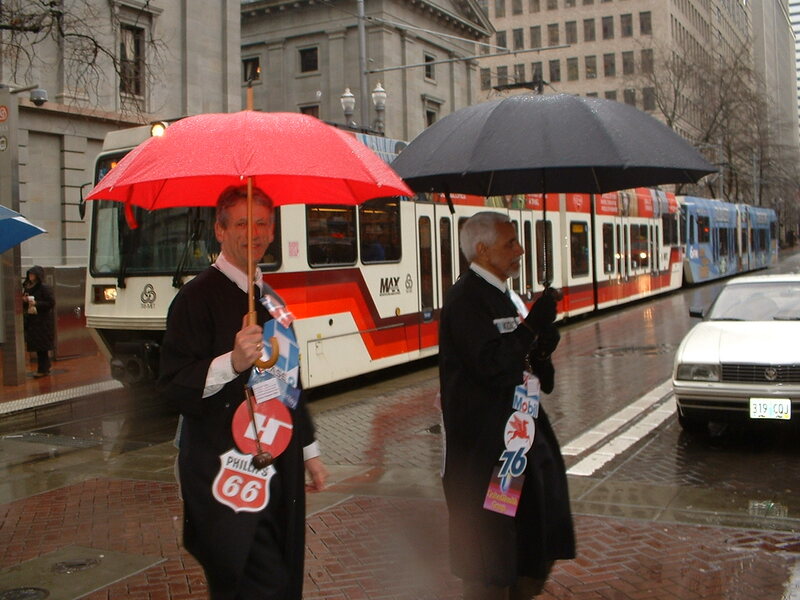 The "justices," armed with gavels and umbrellas, walked to to Pioneer Courthouse Square, City Hall and the federal courthouse. The "good justices" talked to onlookers about the Citizens United case and the need to eliminate corporate personhood and corporate access to personhood rights; the "bad" justices sported sashes with corporate logos. Michael Munk, who played Justice Anthony Kennedy, told the Willamette Week that the theatricality of the Judges Ramble shouldn't outweigh the harm of the Citizens United decision. “This is something to attract public attention,” said Munk, author of The Portland Red Guide, a history of radical movements in Portland. “This was a very serious decision that changes the entire legal history of who is entitled to free speech. Pretending that a corporation has the same legal standing as an individual person sounds to us so absurd." The Portland chapter will hold another event tomorrow (Tuesday, January 25) on "Citizens United and Beyond" from 7 - 9 p.m. at the First Unitarian Church, Eliot Hall, SW 12th Ave and Salmon. For information, see the chapter website's events page.